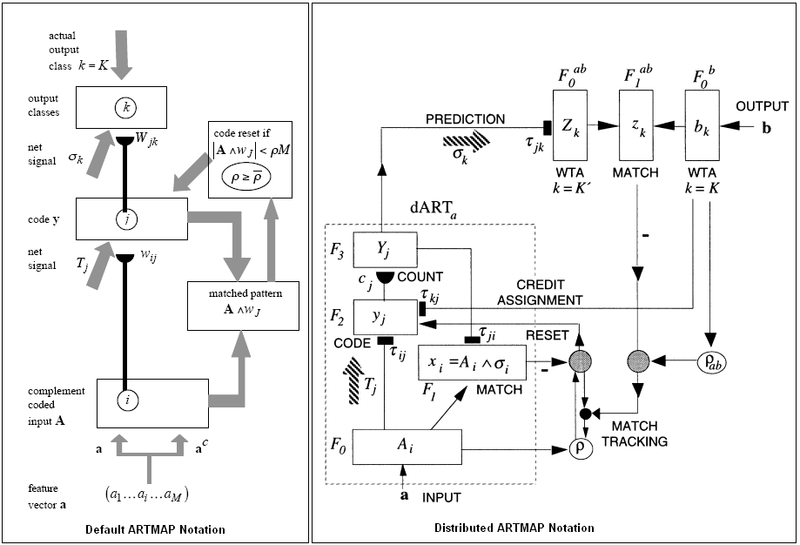 These pages describe the implementation of the ARTMAP algorithm (see articles here) used in Classer. Default ARTMAP Carpenter, G.A. (2003). Default ARTMAP. Proceedings of the International Joint Conference on Neural Networks (IJCNN'03), Portland, Oregon. Based on which of the four models is chosen, different paths are taken through the implementation and different predictive results are obtained when evaluating data sets. Flowcharts documenting the implementations are shown in the documentation for the train() and test() methods of the artmap class. The ARTMAP implementation described here has been developed by Siegfried Martens, working in the CELEST Technology Laboratory, in the Department of Cognitive and Neural Systems at Boston University, Boston, Massachusetts, USA. It is made available to the general public under the terms of Copyleft, as defined by the Free Software Foundation (see discussion here for example). As such, it is available free of charge, and may be copied, redistributed, or modified, as long as any resulting work is distributed under the same terms of Copyleft.